The days passed pretty similarly. Brandt showed Laurie how to do farm chores, milking cows and goats, brushing and cleaning the horses, pitching hay, holing posts. He showed Laurie the lake and his greenhouse where there was a rope and a tire swing. They went swimming, fishing, hunting for crawdads, even in the chilly weather. Brandt's dad had made the stone Laurie gave him into a pendant and he hadn't taken it off since. Christmas came fast, and the night before was usually when the Grayson had their big family dinner. They ate roast lamb, and all the fixings and were given the opportunity to open one gift each. Branet grabbed a small gift addressed to Laurie and handed it to him. "Do you wanna open one?" It was from Brandt. Laurie actually knew a lot about cleaning and taking care of horses, which was odd because he didn't have a rural bone in his body and Brandt hadn't known him to ride or present interest in them at all. As Brandt was learning, Laurie rarely demonstrated a visible sense of himself. He encouraged Brandt to show him everything he could, storing and filing away all the information he learned about his friend, and to spend time with his family in equal measures. They went to visit Mahra a few more times as well. Mahra was unlike Laurie in that he had no control or desire to control his abilities which snared people in like spiderwebs, but with Laurie's supervision Brandt found him to be a peaceable and loving person. Mahra had given him a care package the last time they visited. After one of these visits, Laurie came back with his hair cut, shedding the silly curls for something much more professional. Now that it was Christmas Eve, Laurie was feeling a little sheepish that he didn't have any more presents for them, but he clutched the box Brandt gave him gently in his fingers and gave him a smile. "Yeah, of course." He delicately unraveled the bow on top as though the paper itself were a gift. He was careful not to tear it, unlike Sebastian who ripped away at his box with abandon. Inside the box was another of those wood carvings. It was a small wooden horse. Carved, stained, and polished lovingly. 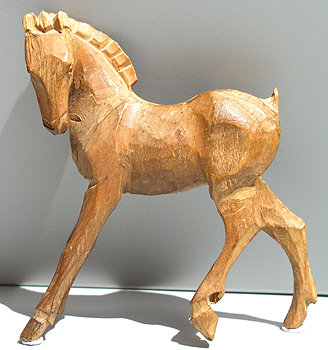 It wasn't intricate or detailed, and obviously done by a novice, or a young boy who loved horses and using his hands. Brandt squirmed a little as he watched Laurie open it, biting his bottom lip nervously, worried Laurie may not like it. It wasn't that detailed, but as papa said, he was still learning. Laurie's features pulled together enigmatically. Brandt had figured out by now that this was the expression he wore when he was actively obfuscating his real emotional responses, but after a few moments he animated again and wrapped his fingers around the carving. Laurie's abilities were far more muted than Mahra's, but Brandt could feel it in the air. Warmth. Gratitude. His eyes closed for a second and then he smiled, squeezing Brandt's shoulder. "This is wonderful," he murmured. "I love it. It must've taken you a while." He grinned, feeling a delicious warmth and happiness settle in his chest. "It did. Pretty much since school started. The tail broke off." He admitted a little sheepishly, blushing a soft pink. "But I asked Sage to help me enchant it, so it animates just like his little paper critters do. You just gotta--tap your wand on its ear." He withdrew his wand, a light larch wood with ornate golden swirls criss-crossing upwards toward the tip, and lightly tapped the creature on the ear. It animated slowly, stretching wooden limbs, then reared up without a sound and trotted a little in place on Laurie's hand. It's movements were awkward and wooden, kind of like watching stop motion animation. Laurie was planning on keeping it forever. "Thank you," he murmured again, eyebrows knitting together. "Truly." Brandt's grin softened and he wtapped his hand around the pendant around his neck. "You're welcome." He gave Laurie a hug. He tensed for a split second before returning it. "From the start of school, huh?" He thoughy they were getting past that but apparently not. He looked apologetic as he pulled away and shrugged. "I found the wood at Hogwarts. My pa always said you gotta let the wood tell you what it wants to be." "It looks like that's exactly what it did." Laurie stroked the horse's head lovingly. The little wooden thing, nuzzled into Laurie's palm. Brandt grinned. "Papa says I'm getting better." But his poor little tailless horse. "Your father has keen insight." Laurie smiled gently. "What kind of cookies should we leave out for Santa, huh?" The question was asked by Brandt's mother and Sebastien jumped up from where he'd been silently admiring Laurie's animated horse. "Snickerdoodles!" He said excitedly. "Can I help you make 'em mama?" "You most certainly can!" Martha took Seb's hand to lead him back to the kitchen. "Brandt, why don't you and Laurie get some peanuts for the reindeer?" Brandt grinned and nodded. "Sure thing, ma." Sebastien still believed in Santa Claus. "...Peanuts... for..." Laurie blinked. "What?" "The reindeer." Brandt said with a grin as he went for the pantry. "You throw peanuts on the roof for the reindeer to munch on." "I don't think reindeer are real." Brandt's brow furrowed. "Full well they are. Have you never seen an actual Reindeer?" "I am sure reindeer are fake." Brandt laughed. "They are not. They're very real. I've actually bagged one hunting before." "That's just a regular deer!" Brandt rolled his eyes. "It was a reindeer, or I guess they're also called Caribou. They are too real." Laurie was clearly poking fun at him, now. He stuck his tongue out. "Real mature!" He teased back and grabbed the peanuts.